Christine Rhoades is a versatile vocalist ranging from jazz and old school R&B to techno and metal/hard rock. Contributed to many Seattle area bands including Flood and The Chauffeur. She is best known for her work on Nevermore’s “Dreaming Neon Black” and Jeff Loomis’ current solo release “Plains of Oblivion”. Her most recent endeavor is a California central coast rock band, Meddling Gretel. She inherited her love of music from her father. She grew up hearing him sing around the house and he encouraged any musical expression from younger brother Mike and her. She joined choir in elementary school and continued into high school where she was chosen by the jazz band to be the sole vocalist to perform with them… this led to her singing the national anthem at many school events. She tried out and was chosen as a member of the Music Company at Green River Community College. Her and a few members of the Music Company formed a cover band performing current top 40 hits in different venues around Seattle’s Puget Sound area by the time she was eighteen. During this period is when she met Warrel Dane and Jim Sheppard of Sanctuary who had just been signed by Sony and were waiting for release of their first album. From this friendship she met Tracy Moody and Rey Guajardo and formed Hand of Grace and recorded a four song demo (which featured a Jeff Loomis solo on one song and backing vocals from Warrel) H.O.G. subsequently broke up before playing a show. 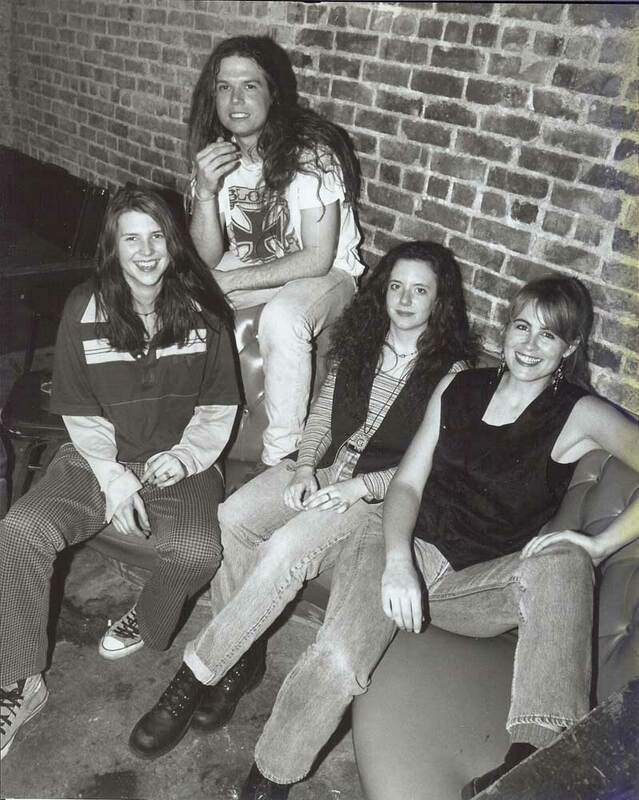 She was introduced to Amy Stolzenbach (“Hells Belles”,) and Laura Bell and with the addition of Chris Hamilton on drums they formed “Flood”… got some local attention and headlined Seattle clubs/venues. On the sidelines.. she joined Nick Rhinehart and Barret Jones on backing vocals for the band “CHURN”…..releasing their album “Titus” on Laundry Room Records. She left Flood to form the Chauffeur with bass player Nick Rhinehart and after a few different guitar players (including Tracy Moody) eventually led to the final line up with Shawn Lawlor on guitar and Colin Owen Griffin on drums…self-releasing an EP on Barret Jones’ label Laundry Room Records in 1996. Built a following and headlined many Seattle clubs. The band got management but as attention was starting to peak, personal differences ended the band. 1997…started a project with Shawn Lawlor (DJ Pacemaker) by the name of Pacemaker & Aquavelvet;; a techno sort of project Shawn had for a while. He dubbed her Aquavelvet because of her velvety smooth vocals and her current habit of coloring her hair blue and green. They would play a few shows in Seattle but the California sun was calling her; needing a change hoping to break a coffee addiction…haha, She moved to the central coast in 1999. Her and Shawn would continue to make music through e-mail and advances in digital musical production. A couple of their songs were featured in the Sherman Alexie movie, “The Business of Fancy Dancing” released in 2002 and the name evolved to Aquapace. 2009… she got a little bored from not being in a band and performing… found some local musicians through ye olde Craigslist and Meddling Gretel emerged.